Good Morning My Saturday Peeps! I have a great little snark for you today. What a better day to find out its WINE and not a good man that makes you feel this good on your wedding day! 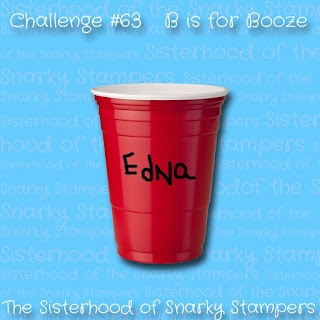 Head on over to the blog and check out my sisters take on the challenge and enter yourself! OMG! This card is amazing! Love the snarky sentiment! Perfect for the challenge! Awesome job sistah! Seriously... I wished someone had shared this with me BEFORE my first marriage! Grin... GREAT CARD SISTAAAH! Second thoughts .... or is that the wine talking? Very clever! I do love when a soft, romantic-looking card sneaks in that snarky punchline! Awesome job!